Better previewing for Group campaigns. Ad Patern “Words to remove” function works only with tag values now. It is renamed to “Words to remove from any tag value”. ActivateKeywordsPerPartes runs separately for classic keywords and keywords created by removing diacritics. Product Group campaigns has hidden URL and Price tags. Url tag is not required. Show only one URL patern for Product Group campaigns. Others can be added by clicking a button. Show keywords preview even wrong url is inserted in product group campaigns. First Campaign/Feed update is set to 20 min. New Custom tag 1 and 2 can be assigned and used in Keywords and Ads creator. All new campaigns can be created as copy of previous created campaign. Added new Sellect all/Deselect all buttons in campaign language selection. Script main enable button is automatically enabled/disabled according to script settings. 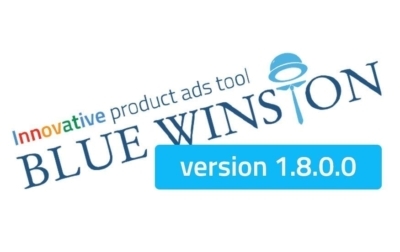 BlueWinston bid management type is default for new campaigns. Keywords preview shows prefix/suffix ”” for types Exact/Phrase. Items in Category and Manufacturer filters are selected all by default. UI improvements and text modifications. Fixed unclickable AdPaterns icons on Safari browser. Fixed draggable tags to show helper in right place after page scrolled. Fixed bug in tagsList (list of words) web UI control. Fixed showing AdPaterns list after Save. Business data feed are created with type Dynamic display ad feed (Custom). Fixed updating only campaign/feed that are not deleted. Cutting Headline and Descriptions in Ad paterns is changed. Tag texts are cut first. Creating Business Data Feeds implemented. Fixed multiple products with the same product name.